The above quote from "The Good Housekeeper" was obviously taken to heart by every school cafeteria cook in the 1950's and 1960's. I can still those miserable vegetables in my mind’s eye— hopelessly flaccid and purged of every molecule of chlorophyll. Mom didn’t serve green beans in our home, and for this I was thankful, thinking that 'limp and gray' was how they were meant to be. 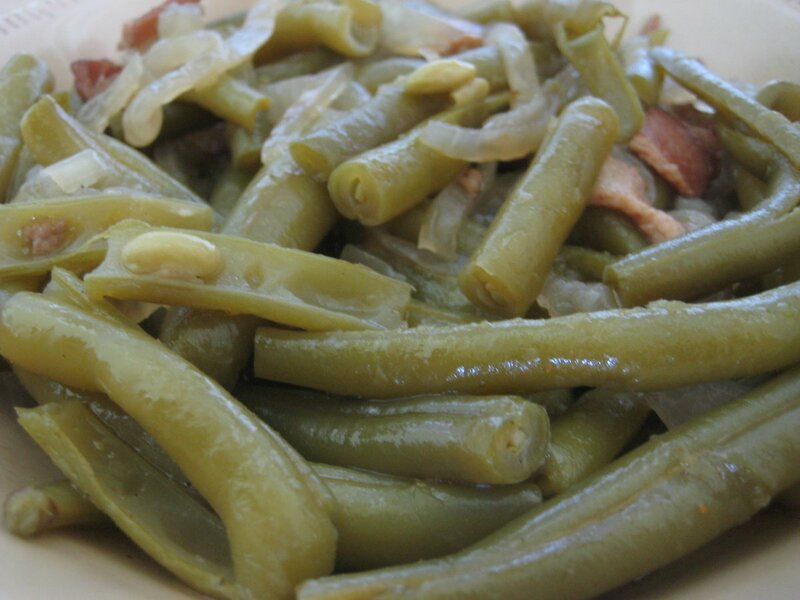 It was about this time in American history that the side dish “Green Bean Casserole” became an ubiquitous fixture in every Thanksgiving Day spread. In my estimation, green beans with “cream of clump soup” didn’t seem like much on an improvement over the lunchroom fare. Long before the internet, where recipes and cooking tips for any and all imaginable foods can be found, there were few sources of knowledge for the new home cook. Sure, there were cookbooks, but they were expensive, large, and cumbersome. Family favorites jotted down on time-worn (and stained) note cards often gave unclear or imprecise measurements and had few if any directions. Here is where ingenuity and marketing genius came to the rescue—food manufacturers (General Mills, Hershey, Heinz, Kraft Foods, and dozens others) produced small, inexpensive (and often free) pamphlets filled with recipes that featured their products. The Campbell Soup company produced many of these booklets—promising tasty, balanced meals for the thrifty, time-conscious housewife. The green bean casserole was first created in 1955 by the Campbell Soup Company. Dorcas Reilly led the team that created the recipe while working as a staff member in the home economics department. 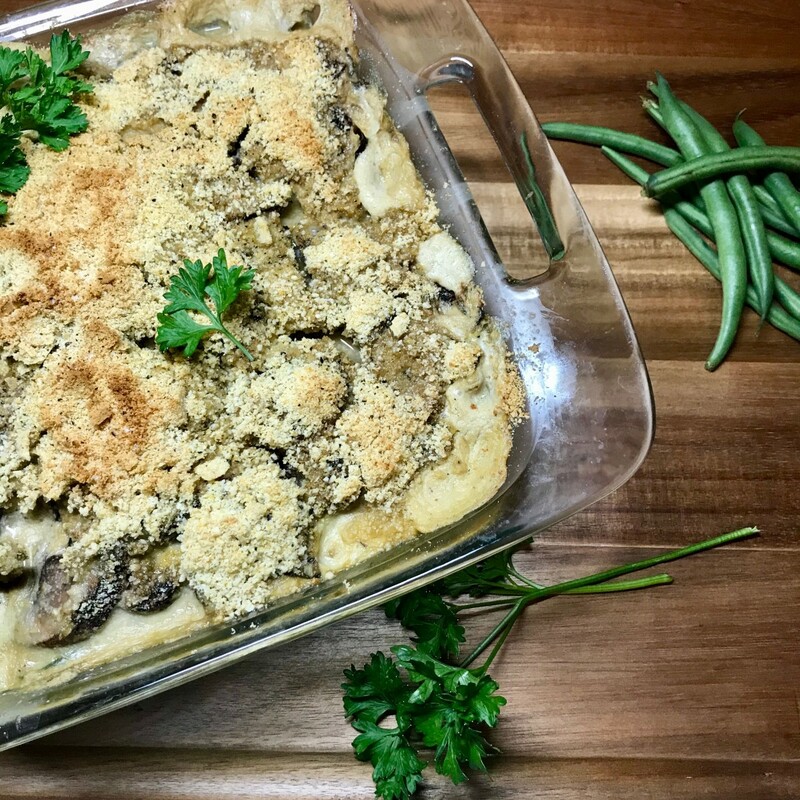 The inspiration for the dish was "to create a quick and easy recipe around two things most Americans always had on hand in the 1950s: green beans and Campbell’s Cream of Mushroom Soup." In 2002, Reilly presented the original recipe card to the National Inventors Hall of Fame in Akron, Ohio. In 2015 it was estimated that more than 20 million households prepared this dish on Thanksgiving—that one recipe accounting for 25 to 30 percent of the company’s sale of cream of mushroom soup in November. There was the green bean. Food historians believe that the green bean (Phaseolus vulgaris) originated in South America. No one can ascertain when the green bean was actually domesticated, but radiocarbon dating of seeds from Peruvian digs estimates that they were cultivated around 7,000 years ago. In 1493 green beans traveled across the Atlantic on Columbus' second voyage home. The people of the Mediterranean soon learned that beans are relatively easy to grow and have a short growth cycle, reaching maturity in as little as 60 days from planting. And so the popularity of green beans spread quickly; by the 17th century they were being cultivated throughout Italy, Greece, and Turkey. Worldwide almost 21 million metric tons of green beans are produced each year. China is at the top of the list, producing about 48 percent. The United States is No. 15 on the list. 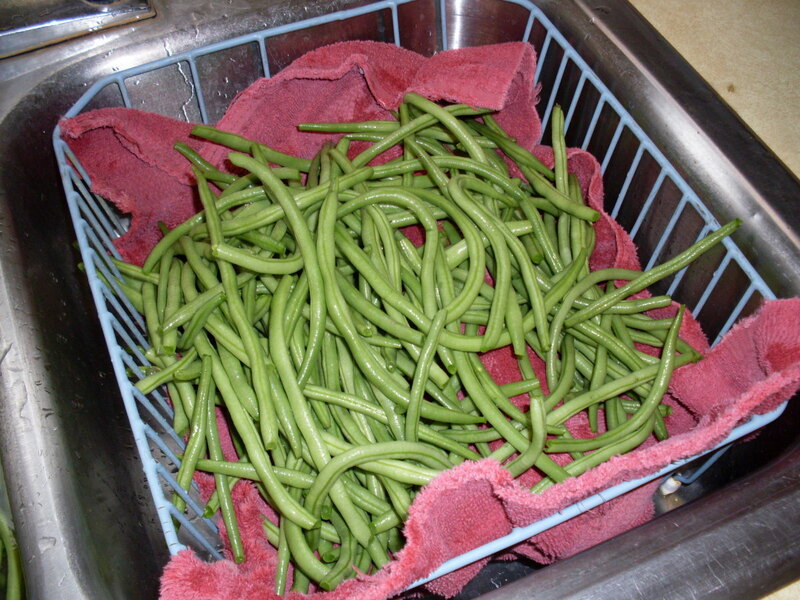 Fresh green beans are available fresh or frozen all year. Bigger isn't always better--plump pods will also contain larger bean (seeds) inside. Do You Want to Grow Your Own? 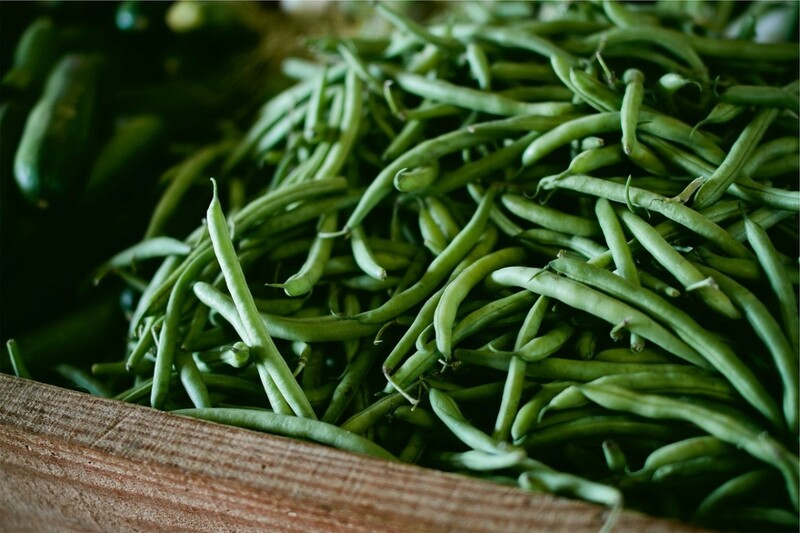 There are two basic styles of green bean plants--pole beans and bush beans. As their names might indicate, pole beans love to climb and perform well along fences, trellises, or vine tepees. On the other hand, bush beans are shorter and can stand without support and so are a good choice for the small garden or balcony. Also known as French beans, string beans, or snap beans. They are the unripened fruit of the common bean—harvested before the seeds enclosed in their protective pods have matured. There are more than 130 varieties. Each pod contains 4 to 6 beans (seeds). China is the greatest producer of green beans, exporting 15 million tons of green beans each year. Bring a large pot of water to a boil (at least 4 quarts). Season heavily with salt. When the water comes to a simmer drop in the potato slices and cook until almost tender—about 4 minutes. Lift out with a skimmer and set aside. Next, drop in the green beans. I remove the stem end and cut them in half, leaving the blossom end intact. Cook about 3 minutes or until tender-crisp, and remove with a skimmer and set aside with the potatoes. Add the pasta to the pot, give it a stir and cook according to package directions until the pasta is desired tenderness. It should be supple with a little bite. When pasta is cooked, reserve 1/2 cup of the cooking water and then drain. Add the olive oil to a large saute pan over medium heat. Toss in the potatoes and green beans and the freshly cooked, drained pasta. Cook for a minute or two to reheat. Stir in the pesto and continue to cook and stir until everything is coated with pesto and is heated through. If the dish seems "dry" stir in some of the reserved pasta cooking water. Serve and garnish with the grated Parmesan. 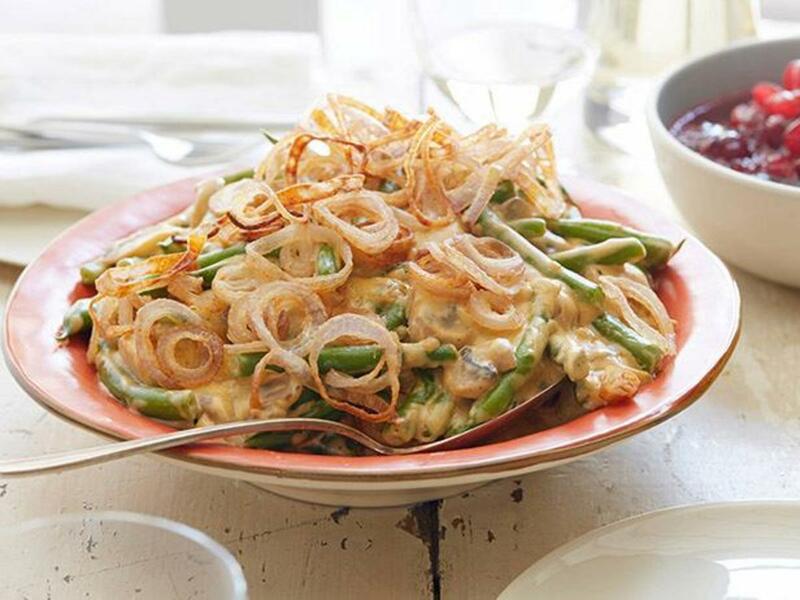 This side dish is a study in contrasts—crisp slightly sweet green beans are paired with the creamy texture and sharp flavor of blue cheese. Olive oil lends a buttery texture and walnuts provide a pop of umami savoriness. 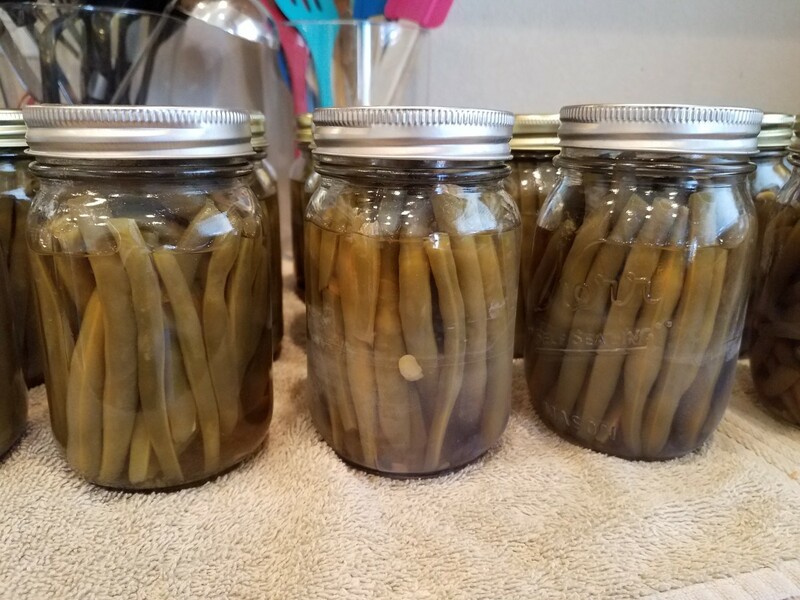 Trim green beans (remove stem end). Steam until crisp-tender. Drain and return to pan. Add olive oil, cheese, and walnuts. Toss to coat. Season with salt and pepper. 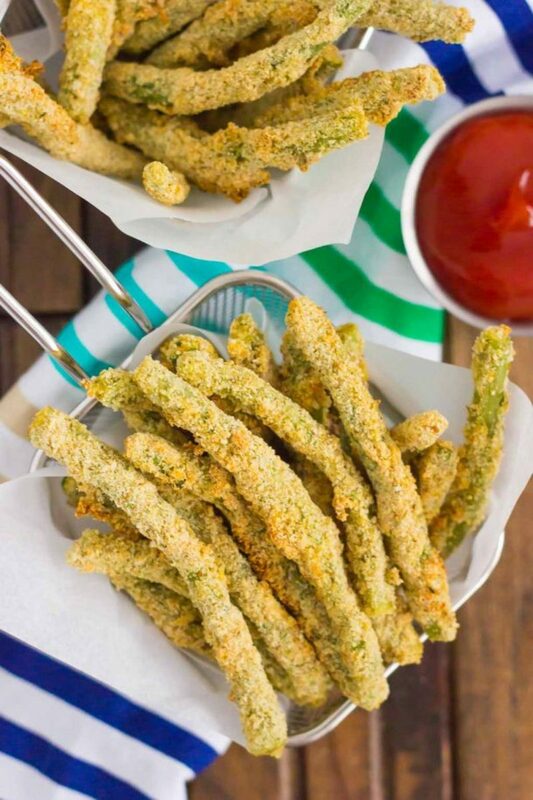 Oven Baked Parmesan Green Bean "Fries"
Think you can't get your kids to eat green vegetables? What if those veggies are french fries? And what if those fries are not really fried at all, but are oven baked? Sounds to me like a truce—both sides are happy. Gayle of PumpkinnSpice.com created this recipe that both parents and kids can agree on. And, if you do make these, please send Gayle a photo via Instagram (tag @pumpkin_n_spice and #pumpkinnspiceblog). This recipe from the Food Network replaces canned cream of mushroom soup with fresh mushrooms, chicken stock, and heavy cream. And the canned french-fried onions are replaced with home crisped shallots. Perhaps a bit more work, but so worth it. Note that this recipe was rated 4.5 out of 5 stars. The few reviewers who did not like the recipe complained that the flavor of cayenne pepper was overpowering. If you know that you don't like the flavor (or heat) of cayenne, I would recommend cutting back to 1/8 teaspoon--or simply leave it out. Lawrence - My husband spent some time in Hong Kong, Japan, and Guam during the Vietnam war, and so returned with a great appreciation for stir fry. I agree that stir-fried green beans are wonderful. I do hope that you will try some of these recipes, and if you do, please give me your feedback. No veggie garden is complete without some form of beans! Mine are dwarf beans (string). My wife hates boiled veggies, I don't like roasted so we enjoy stir fried (delicious and crisp!). Some of these dishes sound yummy. Flourish - We don't have a Penzy's in this corner of the world, and I've never heard of 'mural of flavor'. Would love to know what spices are included. I've wanted to try green bean fries for a long time so thanks for the article. 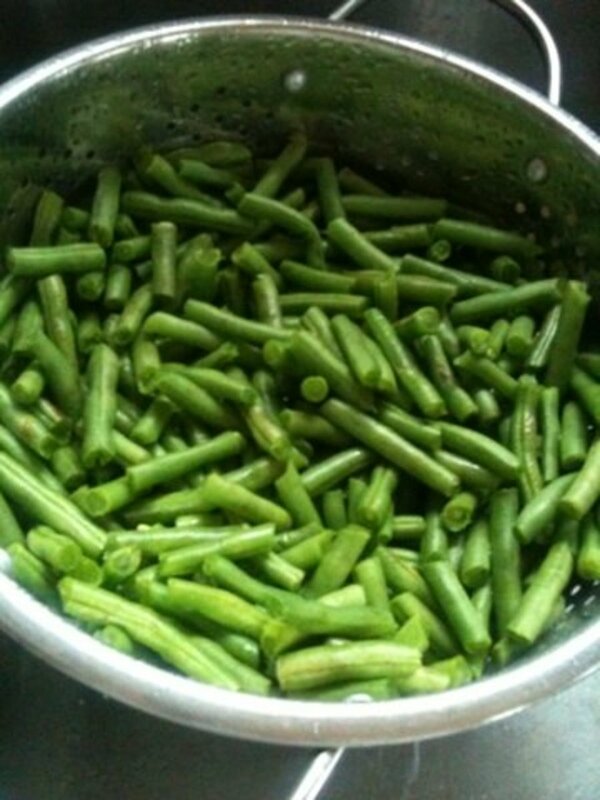 I love string beans and cook them as often as they are available. A combination spice called mural of flavor that I get from Penzy's plus a little butter and salt make them magic. Bravewarrior - I will certainly try to do so, but my family might stage a revolt waiting for me to get "just the right angle" while they "patiently" wait to eat. 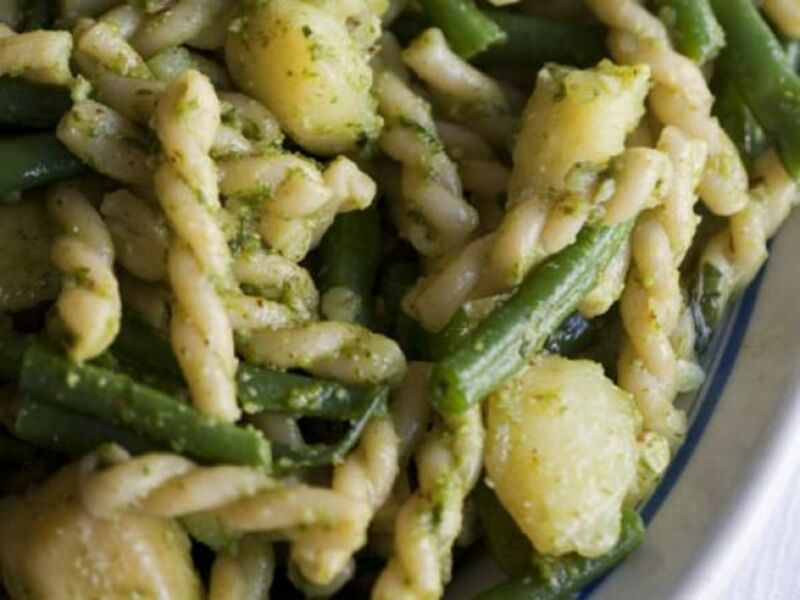 Bravewarrior - If you use only one of the recipes, I do hope you will choose the pasta with pesto, potatoes, and green beans. It is hands down one of my favorite meals and tasting it immediately transports me back to that idyllic time and place. We never had green bean casserole growing up. My mom's a scratch cook and would never dream of using a can of soup as a seasoning for a Thanksgiving dinner side dish. I never had it until I was married to my second husband and his son, who was home on leave from the Marines, requested it. Frankly, I wasn't impressed. The FoodNetwork version sounds much better, but I doubt I'll ever make it. However, the other recipes you feature in this article sound absolutely mouthwatering. I'll have to try all three of them. In fact, I'm printing this page to add to my 4" three-ringer binder of recipes I've collected over the years. Rachel - I had never thought of putting green beans in scrambled eggs, but that sounds really interesting. Anything to get in more veggies. I'm glad you liked my hub, and thanks for stopping by. Hi Carb Diva. I love your hub about green beans. We do grow them in our yard, green and yellow ones. They have to be watched though, because the rabbits love them too. lol The green bean parmesan fries look amazing. My husband likes them with eggs. I boil them for 10 minutes then saute them for a few minutes then pour in a couple of eggs scrambled then cook them stirring them along with the beans. My girls like them that way too. Thanks for this hub. Eric, you're a keeper. Don't want to lose you. Wow Linda you are full of great info. Thank you for taking the time to set me straight. My body thanks you. RTalloni - Thank you for your comment about kids in the garden. I had totally forgotten about that. Yes, beans reward quickly--one of the first things to sprout. Little ones are always amazed that so much can be stored in one little seed (actually, I am too). Good morning Bill. I'm glad you enjoyed the recipes. As for how I feel, typing requires no real movement and unless I read one of your hubs I probably won't laugh (or cry) so thanks for your concern; I'm healing nicely. 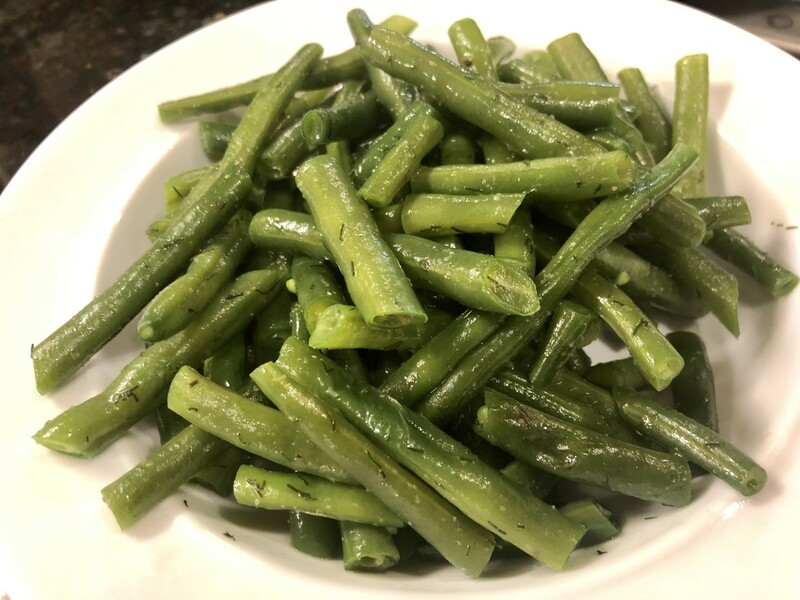 Eric - I too like to eat green beans raw (just a few), but while researching this hub I learned that raw beans contain a substance called lectin. Lectins are glycoproteins that are present in a wide variety of commonly-consumed plant foods. Some are not harmful, but the lectins found in undercooked and raw beans are toxic. While you might assume that consuming raw beans would provide better nutrition, you’re wrong. Beans actually have a better nutritional profile after they are cooked. Beans must be boiled to destroy the lectins. Lectins are thought to exist to discourage animals and other pests from eating the raw beans or seeds of the plant. Animals are apparently able to smell the toxic lectins. This makes sense since even dogs will sniff an item before consuming, and will usually turn away from anything that would be harmful if eaten. Unfortunately, humans have no such olfactory sense. The article went on to state that lectins are highest in broad beans--the ones we grow for the seed inside (i.e. kidney beans, limas, favas, etc.) and those should always be cooked. 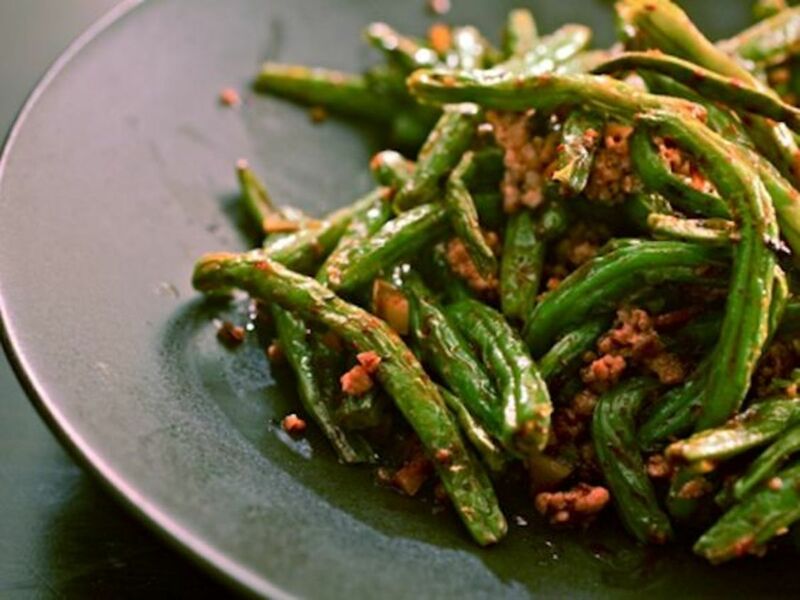 The amount of lectin in string beans is much lower, and so eating a few of them raw should cause no harm, it is best to cook them, even if just briefly. When they are cooked (correctly) their green color intensifies and they still retain that wonderful "snap". This just happens to be one of the few vegetables I'll eat on a regular basis, so I can say, with all honesty, thanks for the recipes. :) Hope you're feelings better, my friend. Green beans really are so easy to grow, making them a great first garden project for kids. You've surprised me with the fact on China being the biggest producer! Thanks for highlighting how versatile they are with these recipes. As usual, deliciously written. Very cool recipes. But as I read it I felt guilty, as I eat mine raw. Very fibery but it has never caused me problems.